More-with-Less is the classic by Doris Janzen Longacre. The sub-title describes it as: Suggestions by Mennonites on how to eat better and consume less of the world’s limited resources. It was first published in 1976 and went through 4-6 printings every year through 1980. And though the pace has slowed down to only 1-2 printings per year, it is still going strong. I purchased a copy in 1977 and it has been one of my main standbys ever since. Indeed, I used it so much that it virtually fell to pieces. The copy I have now is a replacement published in 1992. Let it not lie uncared for, unwanted. The whole book resonates with the spirituality of eating more simply and with more joy and gratitude. Fewer dishes per meal means one can centre a meal on salad or bread or soup instead of using them only as sides or appetizers. Avoiding pre-packaged foods and learning to use simple, basic ingredients allows genuine creativity in the kitchen. There are plenty of ideas on meal planning and sample menus. Almost every page has great cooking tips and comments from contributors. There is a section on gardening and preserving the produce. There are even some non-food recipes. I have made the paste and play-dough for my children. I have not attempted the homemade laundry soap. I don’t know any cook who can be contented with only one cookbook, but if I had to make a choice, this would likely be it. 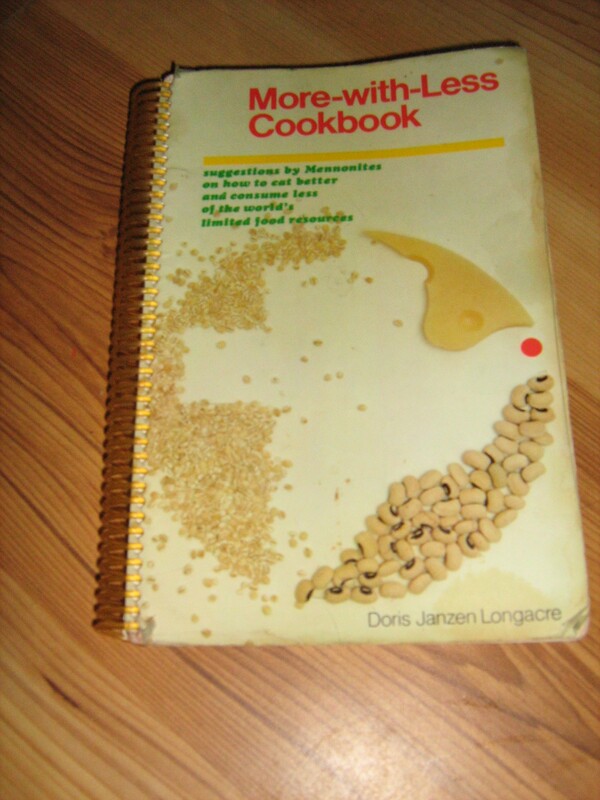 This entry was posted in The cookbooks and tagged classic cookbook, cookbooks, Doris Janzen Longacre, inspiration, La Leche League, meal planning, Mennonite, More-with-Less Cookbook, simple eating, simple living by gluadys. Bookmark the permalink.